A charismatic figure on the soccer field, Tony Adams was a true leader for team Arsenal and England. He won league titles over three separate decades, and after the Gunners moved to their new stadium at the Emirates, it was fitting that a statue of him was placed outside to celebrate his extraordinary career. 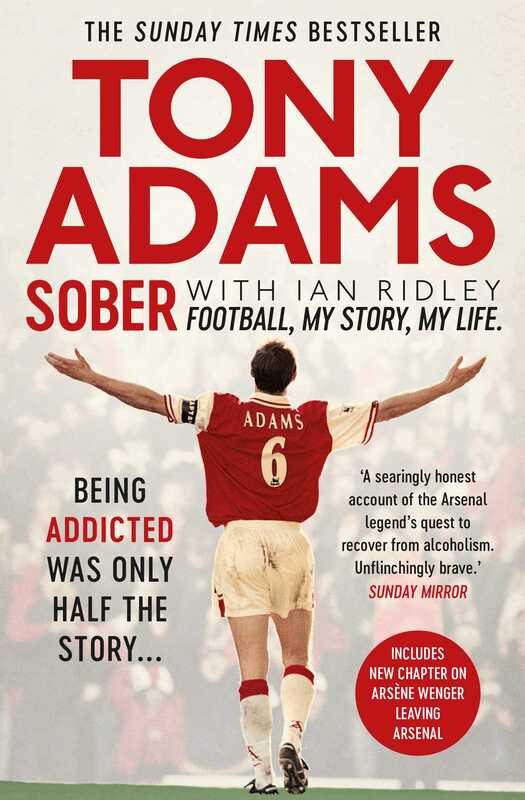 But, for much of that time, Adams was drinking heavily and ultimately revealed in his book Addicted that he suffered from alcoholism. Now, in this stunning follow-up, Adams shares what happened next. He discusses the impact that Arsene Wenger had when he arrived at Arsenal in 1996, and how the manager’s new methods helped extend his career and brought new success to the club. Having a strong mental game in addition to his athletic skills, Adams moved into coaching and management on retirement, playing a key role in Portsmouth’s famous FA Cup triumph in 2008, and taking on new challenges in the Netherlands, Azerbaijan, China, and Spain. Adams reveals his rocky journey to stay sober for twenty years and why he set up Sporting Chance, the charity which provides treatment and support for sports stars suffering from addictions. He shares his insights on England’s continued struggle to win major tournaments and assesses why Arsenal has not been able to repeat the title-winning formula while he was there. Honest, powerful, and compelling, Sober is a truly inspirational memoir from someone who has battled and overcome his demons—but continues his recovery, one day at a time. Tony Adams played more than 650 games for Arsenal during a twenty-year career at the club, serving as captain from 1988 to 2002, and winning four league titles during that period. He won 66 caps for England. After his playing career ended, he managed or coached at Wycombe Wanderers, Portsmouth, Gabala in Azerbaijan and worked as a vice-president of the DDMC sports management company at Chongqing Lifan in China and Granada in Spain. "Addicted was like his football style - honest, brave, inspired and unwavering. It gave me the inspiration to deal with my own issues; here was a man openly talking about his problems and embracing life’s challenges. Reading it had a huge influence on me and I can’t wait to get stuck into Sober, I’m sure it will give many strength, myself included. Bless you Tony."